Trading tips. Setting Stop Loss Limits. In our case study on setting stop loss limits we reviewed stop loss limit estimates for Oil, Gold and Silver futures trading. As a trader capital management can be your biggest strength or your biggest weakness. Setting and reviewing stop loss limits on a regular basis is part of both trading discipline as well as a trading system that reallocates capital based on market volatility. In terms of trading tips, reviewing stop loss triggers become important as your style matures and you become a more experienced and professional trader. In this post we will take a look at market based triggers that should lead to a review of stop loss limits. The original stop loss threshold we had initially calculated are linked to volatility levels. As volatility levels rise or decline, the range of price swings also adjusts. Volatility levels also have an impact on the markets view of price direction. A chance in volatility levels should trigger a review of stop loss limits to see if a tightening or widening of the stop loss band should be recommended. If you don’t track volatility or are not focused on the right moving average, a proxy indicator is the actual limit breaches compared with anticipated limit breaches. Here is a quick test. In the chart below you can see the trailing volatility levels for Crude Oil (WTI), Gold, Silver & the USD-EUR exchange rate. 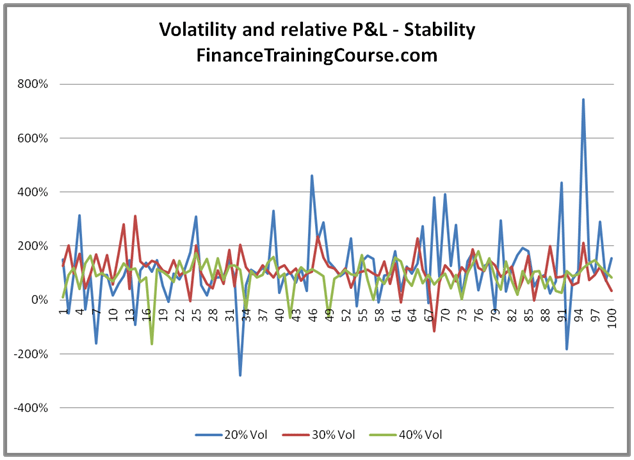 Each spike and subsequent collapse in volatility levels is a candidate for a stop loss limit review exercise. When reported limit breaches cross expected limit breaches you should review stop loss limits to better understand the rise in limit exceptions. Is that because the original limits were set incorrectly or because volatility levels and thresholds have changed? Capital and Profitability are two additional triggers that have double touch (top and bottom) threshold. If you hit your profitability target switch to passive mood and book your profits. If you hit your capital contribution target (also linked to profitability) once again do the same. Counter intuitive but safe. Finally liquidity and trading volumes in the underlying market determine the amount of time and price impact you will have to book before your position is sold off. Like volatility a drop in market liquidity should trigger an immediate review and should lead to a tighter stop loss band. How frequently and widely does price volatility move? 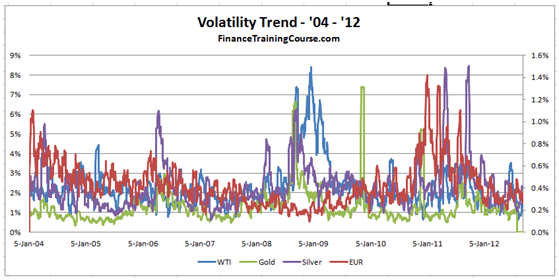 As you can see below for Gold and Oil prices daily return volatility ranges from 0.5% to 8% in the last 8 years. A half percent move when oil is trading at $50 is worth 2.5 dollars. An 8% move when oil is trading at $150 is worth $12. Hence the argument for reviewing stop loss limits on account of changes in volatility and liquidity levels. Back testing stop loss limits is a little bit more involved. Once we agree on a threshold we need to simulate using historical data the entire sequence of events triggered by a stop loss limit breach. The trigger is hit, the position is sold, the stop loss related hit booked against the available pool of stop loss capital. The question we want to answer is how long will it take before the capital pool runs out. There are multiple economic capital, shortfall and expected shortfall models out there that allow you to do this. 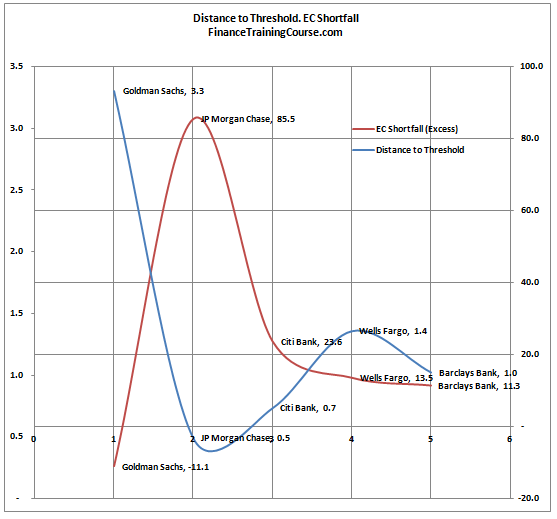 Also see a detailed treatment of calculating expected shortfall from a return series in Excel. To do this correctly and accurately you need market trade data with volumes. Once the limit is breached we sell the entire inventory at market prices using market volume data if available. If the data is not available we need to build a simple impact cost model that forecasts or simulates market prices based on the size of the sell order and market direction. The final tweaking in stop loss limits can be made after the back testing exercise has been completed and we have tested the sufficiency of the capital pool. Previous Previous post: 12 months, 700 orders & half a million page views later.